Contamination, fraud and adulteration are serious issues in the food industry today. Without the proper protections in place, your product could be at risk. To ensure that the organic ingredients you buy are authentic and safe, it’s important to work with trusted suppliers that have a strong Quality Assurance (QA) program. These programs should include food safety audits, FSMA compliance, organic certification verification, import verification and strict qualifications for suppliers. To gather more information, we interviewed Global Organics’ Corporate Quality Manager, Isabelle Favato, who is also a registered ISO 22000 Food Safety Management Lead Auditor. She explained the components of a successful QA program and outlined our unique approach to quality and food safety. 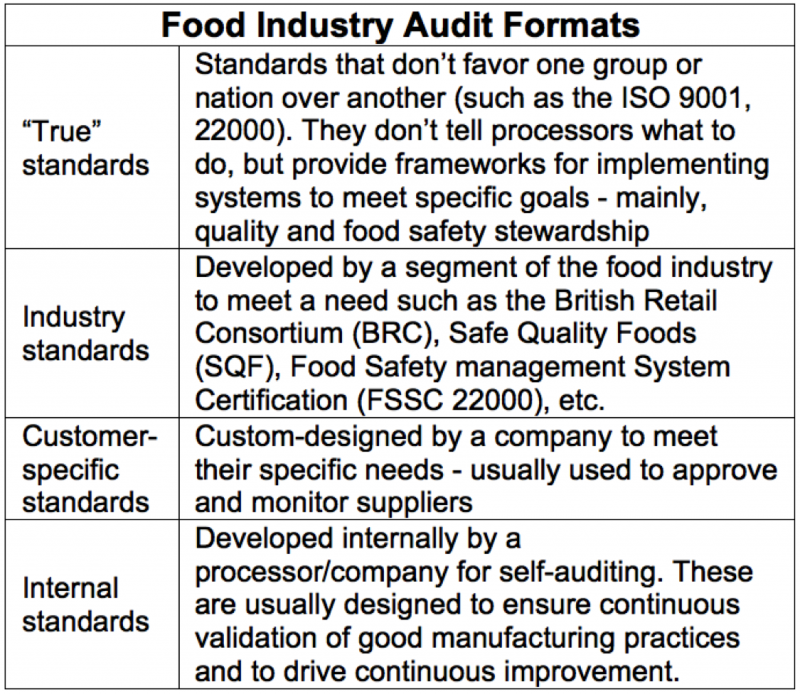 According to Isabelle, food safety audits are the food industry’s main tool to evaluate an operation’s food safety practices. Audits are key components in verifying proper food safety at processing facilities, validating the processor’s QA practices and providing transparency. They're also critical in achieving certifications. 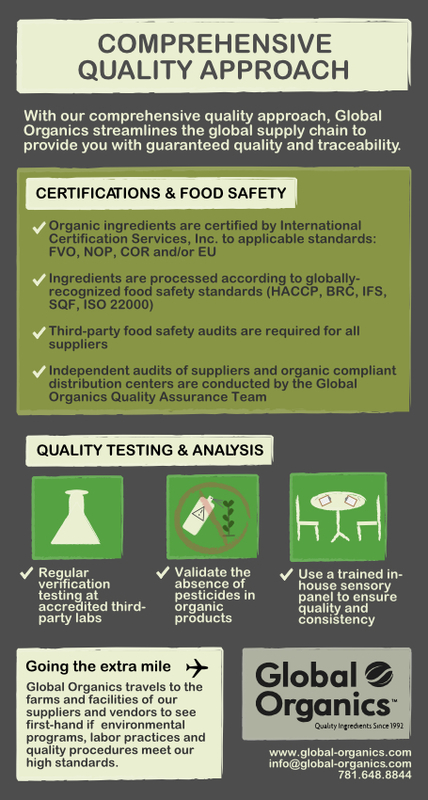 Proper QA and food safety practices are especially important when sourcing organic ingredients. There is not enough organic farmland in the US to meet the demand, so manufacturers must rely on imports that meet US organic certification requirements. However, enforcement of organic standards varies widely across countries. Also, because of high demand, some suppliers will cut corners to reap profits. Vetting global suppliers is a key first step, but lab testing is crucial to further verify that their products match their documentation. For example, Isabelle noted that Global Organics routinely tests ingredients for pesticides and contamination at accredited third-party labs. There have been times when prospective suppliers were not approved. Despite showing organic certification, their products tested positive for pesticides at higher than trace residue levels. QA policies that take more than required documentation into account (like our organic integrity and food safety programs) truly minimize your risk of receiving non-authentic or defective products. For years Global Organics has been implementing QA practices like those outlined above so we can provide you with the products you expect – without surprises. Unlike a broker or trader who merely forwards documentation, our quality team personally verifies each of our suppliers and ingredients. Our well-defined QA program ensures that all of our vendors understand and follow our food safety and quality requirements. This is part of their qualification as a Global Organics supplier and is necessary for maintaining approved vendor status with us. Having a special understanding of our processing partners means we’re prepared for any specific quality and food safety requirements from our customers. Isabelle said, “We work with industry leaders to cover all necessary QA aspects when sourcing our ingredients but we understand that our customers have unique needs. For example, they might require special testing depending on their product application or company policies.” We are happy to work together with your QA team to fulfill customized QA requirements whenever possible. Then we can provide you with safe, high quality ingredients that fit your standards. Here’s the bottom line: Global Organics is committed to providing the highest quality organic ingredients. Our strict QA program and willingness to work with our suppliers and our customers ensures that you can consistently receive ingredients that match your specific needs.